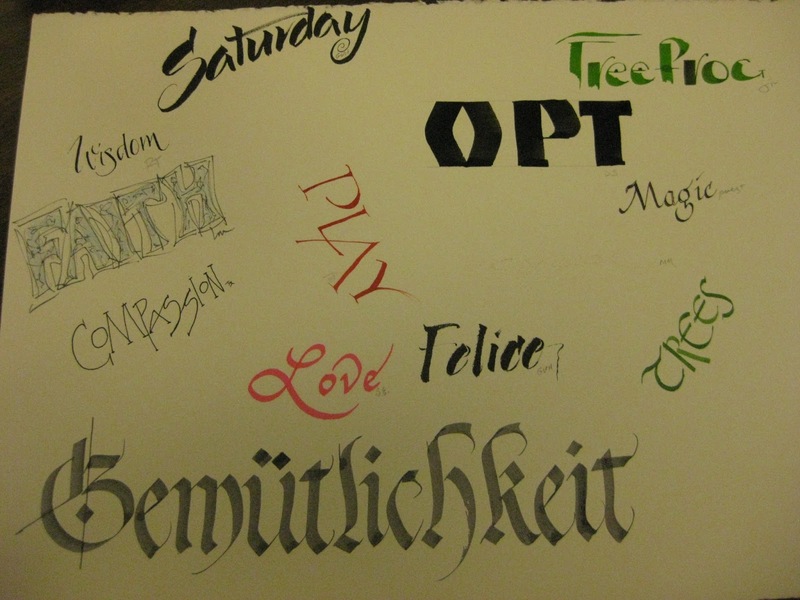 We have many talented people in the Michiana Calligraphy Guild, and some of them do other things besides calligraphy. The St. Joseph Valley Watercolor Society had an exhibit at the Jewish Federation Building in South Bend for the month of January, and I was fortunate enough to be able to get to see it. 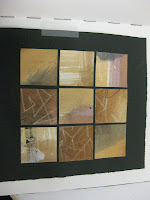 Congratulations to Barbara Walsh, Marty Mitchell, and Barbara Rogan for the pieces that they entered into the exhibit. January’s meeting brought 8 people together on a cold January Saturday to do some show-and-tell. 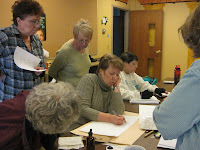 Again in February, we braved the snow and cold to be together with our fellow calligraphers for our monthly meeting. The roads weren’t great, but upon arriving at the meeting, we found that very few regular members were missing from the table. It was a wonderful sight to see and to know that we all enjoy our get-togethers so much, that we do so in any kind of weather. Jo McPherson brought samples of Sherri Kiesel’s work and also did a demo on how Sherri showed us how to do miniature watercolors. Sherri was in South Bend twice several years ago and we have always loved her work. This year we are highlighting what instructor has inspired us so that our year will be full of wonderful demonstrations and sample work. Thanks, Jo! Our March 2nd meeting highlighted Reggie Ezell with Diana Stamper demonstrating Romans with serifs. We spent 6 months working on Romans with Reggie in 2000, so we have many different varieties from which to choose. 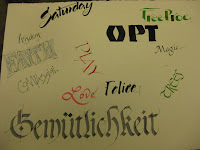 I am sure that I speak for many in that the year we spent with Reggie was a big influence on our calligraphy today. Thanks, Diana, for bringing back so many good memories and for your demo. Next, we did a writing “experiment.” In February, we had the homework of writing a word, one word that was meaningful to you. You could write it in any ink or tool of your choosing. A piece of Stonehenge paper was passed out to everyone at the meeting, and we all got to put our practice of writing a word to good use. Everyone wrote their word on the paper and passed it to the right, and that person wrote their word on the paper, and so on. There were thirteen people at the meeting, so we had thirteen words on the paper in all colors, hands, and styles and a piece of each other’s work to take home and enjoy. We decided that we would do this again sometime by writing just our first name or writing numbers on the page, since this was so much fun the first time around. Thanks to all who participated! Those that know me well know that I am an outgoing person. I have no problem speaking with anyone whether in an elevator, on the street, or places like Hobby Lobby. I went there recently and, as I strolled through the aisles, I came upon a woman looking at calligraphy books. I stopped and asked her if she was a calligrapher, and she said that she was just beginning. We chatted about different tools she could use and, of course, I gave her our blog address and the times that our guild meets every month, inviting her to join us. If Diana Stamper had not told me about the Michiana Calligraphy Guild, I don’t know who would have stopped to tell me that there was such a group. Continue to spread the word and invite new people who may be interested in our art form. Our guild has grown in the last few years, and it is exciting to see the upswing in membership. 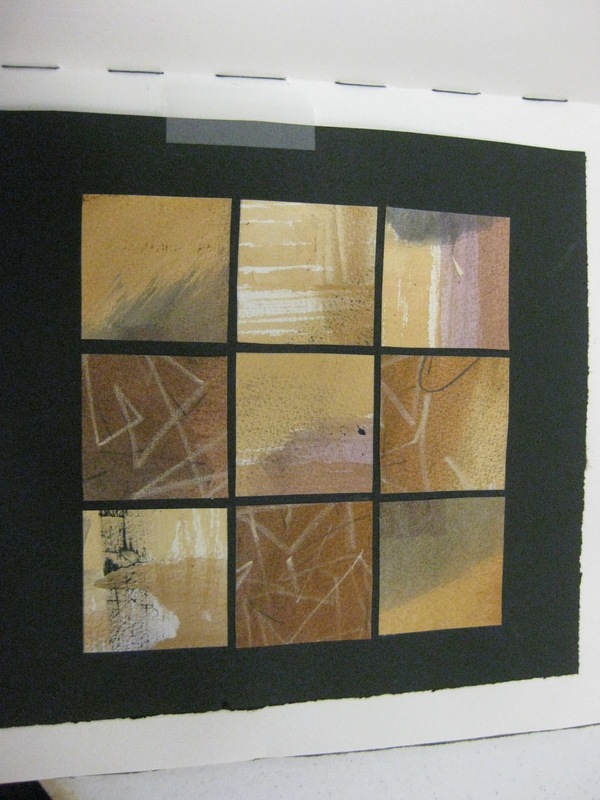 Rosie Kelly will be here on April 20 and 21, 2013, to teach a two-day workshop topic, Playing with Design Possibilities. This is a change in the original date. Rosie always brings us fresh, new ideas, and we are always happy to have her with us. Cost will be $100 per person or $115 if you are not a member of the MCG. The workshop will take place at the Whispering Pines Community Room in South Bend. At this time, the workshop is filled, but we can put someone on the waiting list if they are interested. Instructions to Whispering Pines will be sent with the reminder before the workshop. Barbara Mann will be coming to South Bend to teach a two-day workshop called Paintbox Flowers on October 5 and 6, 2013. Barbara is a member of our guild living in Michigan and gave a workshop several years ago. We are thrilled that she will be joining us again. More information will be forthcoming in the next few months. Recent workshop in Kalamazoo – Laurie Doctor – Deepening Surfaces Five members of the MCG (Anna Schlemma, Rose Kopec, Meg Jung, Marianne Burke and Ginny Vander Hey) spent three days in Kalamazoo with the Pendragons and instructor Laurie Doctor from Kentucky. We learned to mix acrylics into neutral tones using only three colors of which I would never have thought would make a terra cotta or a gray. We wrote with a shell or a small pen to enhance our papers and, in general, loved every minute of it. We always started and ended our day with a bit of yoga to free our minds of the outside world and to begin to “come to the circle.” Laurie was a wonderful instructor, and we hope to put her teachings to good use in the near future. I was playing around one day with design from Laurie’s workshop and had it on the counter for my husband to see. He didn’t really like it because he couldn’t read it! Now, some of the letters were Peter Thornton’s Romans, so I don’t have a clue as to what he couldn’t read. Then that old adage came to mind…"beauty is in the eye of the beholder." If it is going to hang in our house, I guess he will have to be able to read it. OY! Plan B.
April 6, 2013 meeting…we will be making paste papers until approximately 4:30 pm at Christ the King Church. There will be Arches Text Wove paper for sale for $3.25 per sheet. There will be a sheet to indicate how many sheets you are buying and how much you will need to pay. Please pay Maureen Trubac before the beginning of the session, at lunch, or at the end of the day so as not to disturb her creativity! Also, please bring your own paints, tools to make marks, paper towels, newspaper to dry the sheets on top of, water containers, brushes, etc. Sharon Esmont will bring the plastic for the tables and floor. If you wish to make cards or do something else that day, please do so. Variety is the spice of life! Lauren Matacio will be doing a demo on Lisa Englebrect, and we will have a short business meeting between 11 am and our lunch time. The doors for the church will be open by 9 am for those who want to come earlier than our appointed hour. Don’t forget to bring your own lunch and a drink. I enjoy sharing new websites that I have come across in our blog. If you come across something that you think would interest the whole group, please email them to Ginny, Amber, or Renee, and we will get them on the blog for the next quarter. At our Christmas meeting, we discussed what instructors we would like to have for 2014 and what we want to review during our meetings every month. We made a list of our past instructors, and some of our members took a month and an instructor to talk about and possibly demo on that day. The instructors that have been chosen have impacted the art of that particular member and remain one to whom she goes back for inspiration. April 6 – Lauren Matacio – Lisa Englebrecht – We will also spend the rest of the day making paste papers at Christ the King Church, our usual meeting place, until about 4:30. May 4 – Sharon Esmont – Simple Binding – We will be binding our recipes that we did last year. Please note that our May 4th meeting only will be held at the Francis Branch Library at 52655 N. Ironwood Road in "The Pasture" room.